An Artist's Life For Me! Sit on the shoulder of a working artist and nosy into the ups and downs of my world. Stow away on my adventures, to learn how my reportage-sketching works; watch how my picture books are created, from your spy-hole inside my studio; sneak a peak into my sketchbooks; join me on my newest exploration into the colourful world of textiles... and be there to help me tear my hair when things aren't going to plan! I often get emails from people who've seen my train drawings, asking for advice on how to go about sketching strangers in public. So, although I have probably said a lot of this before, in bits and bobs, I thought I'd put it all together, to maybe help give people the confidence to have a go. 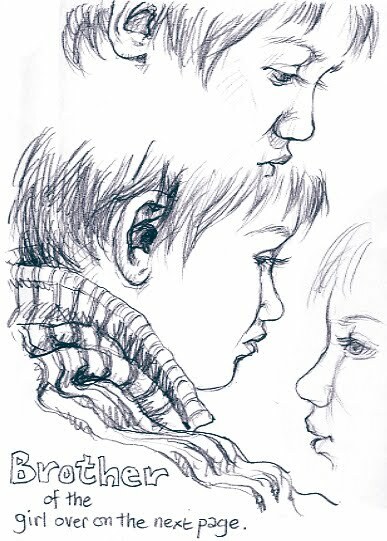 Firstly, I never, ever ask permission: if you do that, you're stuck drawing a 'portrait', which is a totally different thing; people are no longer natural, plus there's suddenly an expectation on you to achieve a likeness (as well as a need to make sure it's flattering! ), which makes things quite stressful. My 'victim' sometimes works it out halfway through, but then they tend to hold the original position and carry on with what they were doing. There are tricks: firstly, I have found trains are perfect - when people are travelling, they have less objection than when they're 'at leisure'. It's dead time, so somehow up for grabs. I know sketchers who've been challenged for drawing strangers in a pub or restaurant: people can feel you're invading their privacy in these places. Museums, galleries, cafes and queues seem to be other universally acceptable venues. Buses are too bumpy by the way, and people get off too soon. I always choose a table seat on the train. It gives you a better view of more people. The main reason though, is I can put my handbag on the table and my sketchbook in my lap, so it's hard for anyone to work out what I'm up to. 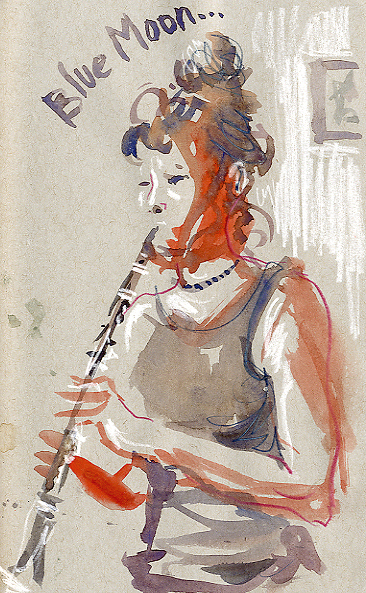 I try not to draw people with friends: conversation makes them move constantly. People reading books are good, but newspapers are a problem: too many different head positions as they look at different articles! People sleeping, texting or at laptops are the best of all - total absorption, so they rarely see you, and they hold one position for ages. I sometimes show people, if I'm proud of the drawing. Also, if they realised I was drawing them, it's a nice courtesy. I've had some lovely conversations as a result: it's a great way of bonding with complete strangers in a weirdly random way. It's funny when you show people: the reaction generally ranges from disbelief or surprise, to feeling flattered. Non-plussed is the most negative I've had so far. If you are new to it, I suggest you focus on particular details - shoes, hands, bits of faces - rather than going for the whole person. Go for venues where folks are likely to be sitting for a while. I tried the forecourt of a station once - hopeless: everyone was in a hurry and very twitchy! Oh, and a hot tip if you work in pencil, carry at least half a dozen ready sharpened in a pencil case (3Bs are my favourite), that way you never need to stop and sharpen mid-way, and miss the moment. Remember: the first sketch is the hardest, so screw up your courage and just make a start. You will get better too, honest! 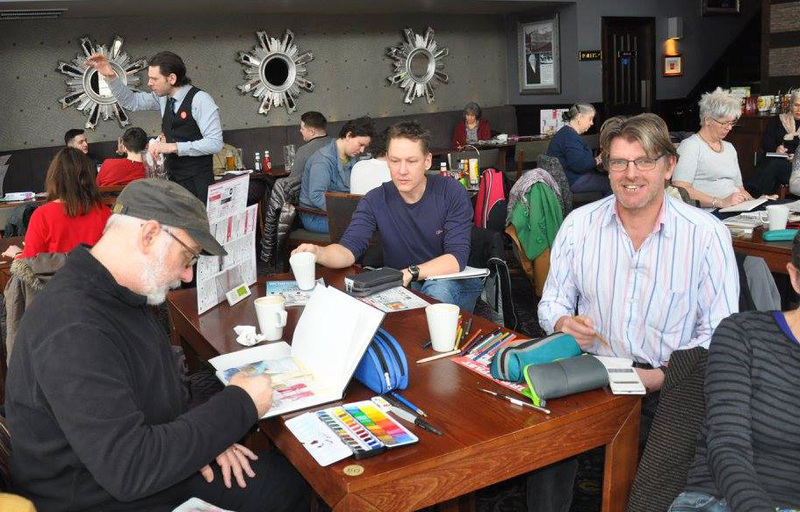 If you still feel too self conscious, why not get together with friends and do a sketchcrawl with friends? 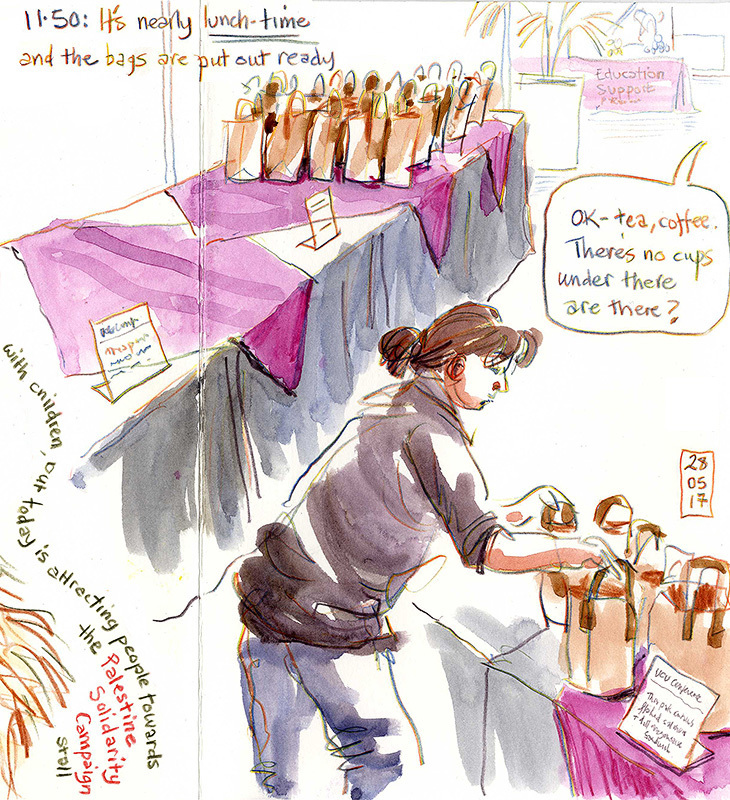 You can view a selection from my various sketchbooks on my website and I have created various short films about how I use my sketchbooks, which might be useful in getting you inspired. 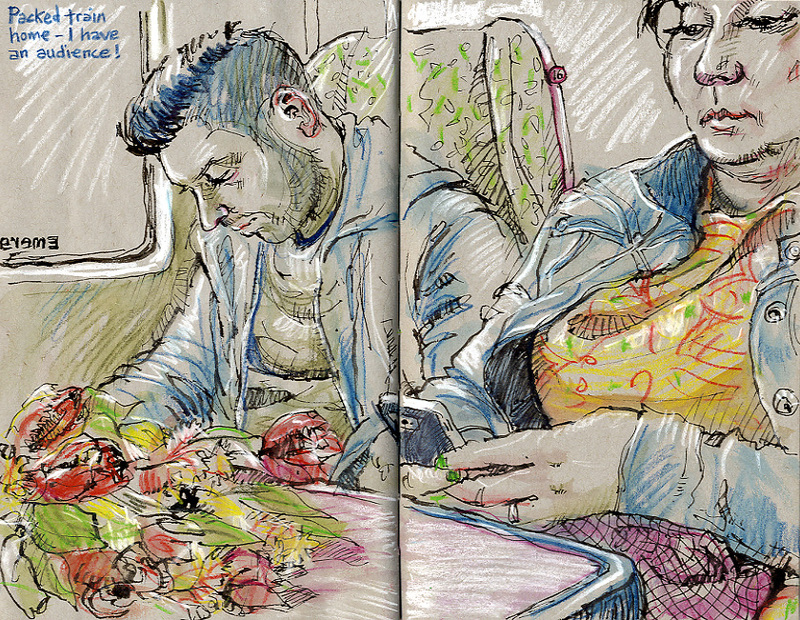 My book Sketching People, goes into a lot more depth on all the above, and much, much more. 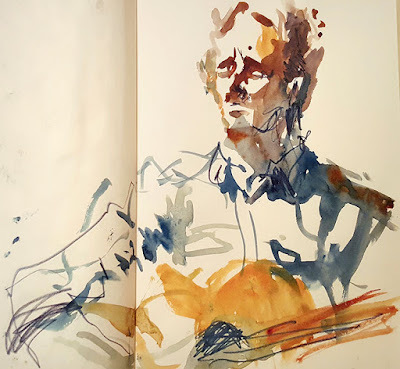 If you would be interested in attending a sketching workshop in person, please sign up to my mailing list, so you get all the information of what events I'm running and first refusal on places available. Thank you so much for this post. It is so helpful. I love your work. Do you mind if I follow your blog and would you have info you can e-mail me on your services? Appreciate this post very much!! Really wonderful post. Thank you so much. I have to be really brave to draw in NY Subway, where mostly you sit across each other. Love your line work. Fantastic sketches. Love your shading. And the solidity of the folded arms. How do you add the colour in ? Thanks folks - glad you like the drawings and the info is helpful. 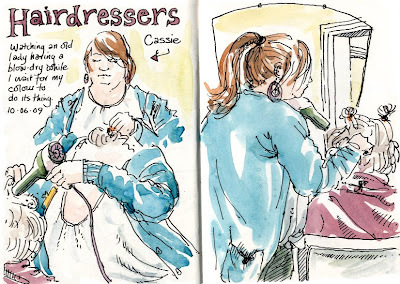 Keith: the shading is mostly done in Photoshop afterwards, though the hairdresser one is a rare watercolour. Thanks for sharing this with us, Lynne. I have also drawn people but find if it is a pub, they are usually quite lubricated by the time I finish and so don't care the result is nothing like! I didn't realise much of your shading is finished off with Photoshop. I always feel under pressure to make a well-rounded sketch in situ, so you have taken the heat off. 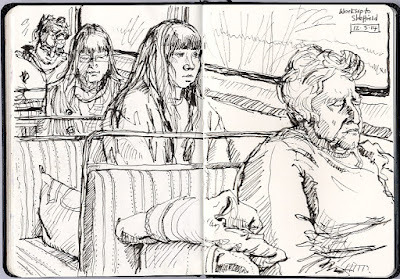 I was sketching on the tube in London once, a great place but so difficult because everyone gets off too soon! Yes Noxx - the tube is very tricky. Bella: I meant to say 'tinting' is added in Photoshop, basically I add the colour later if I have a bit of spare time. I might actually pluck up the courage to do it now! Thanks to your wonderful advice. BTW has anyone ever drawn you back? Great sketches Lynne. The idea of 2 sketches of same person si good. Will try that. Do you also play the 'i am drawing the person next to you eye trick?" When your subject seems to notice you sketch them you look away at a nearby subject trying to throw the person who is being drawn. You seem to be more upfront about your sketching., I always do it on the sly..especially after I got "caught" one day a few years ago and confronted. That put some stiffness in my otherwise uninhibited sketching. Its come back a bit but never the same. The sketches and your comments are a great read. Would make fort an interesting book on this subject. Yes, I do that too!! I feign great concentration, as if the person next to them is REALLY tricky to draw. It works for a while, but they usually suss me in the end. Was your confrontation nasty then? So far it's never happened to me. It was nasty. A youngish woman walked the length of a nyc subway car to stand beside me and tell me I was breaking a law...her attitude was brazen (I should talk right) and stood beside me giving me a hard time until her station came up and she was off. I suppose it could have been worse but given that I had never been confronted before this stood out and came upon me unprepared. Oh well, such is the life of a sketch artist. Oh, poor you - that's sounds like a horribly upsetting, not to say embarrassing ordeal. I think she must have been one HB short of a pencil case though, don't you? Be reassured though - it's surely very unlikely to happen again. "one HB short of a pencil case"
my favourite subject is my boyfriend, when he's playing on his playstation 3, the perfect moment for a sketch! Maybe I should switch to pencil, I'd probably squeeze more sketches in that way! 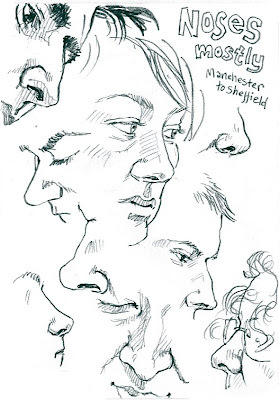 I've always invariably used pen for train sketching, mostly a Pilot Hi-Tec-C 0.4, though I've been known to sketch directly with a dip-pen and bottle of black ink (not recommended for crowded trains or bumpy rides!). It's a gift given talent, it's no joke you were able to draw so fast those subjects you did. Bravo! I myself do all my drawing -so far- in and around the bus. It is my main means of transport around town. I have become known as the bus artist here in Rochester, NY. I insist on using a fine tip sharpie marker so I am forced to leave my mistakes for me to see. It has helped me be better at my work. I started sketching to help me be more expresive and to be looser with my work since my finished work tends to be overly detailed and tedius-therfore slow. I love what it has done for me and a lot of what you have said about drwing on the trains is the same on the bus but tighter quarters. I am now on the usk list as a member. Trying to build up a group of usk members here. 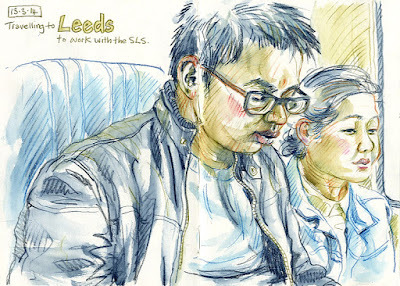 Welcome to Urban Sketchers Mark - I will look out for your work. Good luck with those bus drawings - tricky stuff! Amazing work. Congratulations and thanks for sharing! 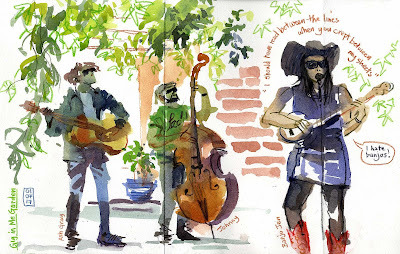 Thank you for responding through your recent post on Urban Sketchers. All your advice are really helpful! I feel the same too that if I ask permission to draw the person, the natural pose will be lost. Your sketches are amazing! How long did these take you? Glad it's helpful Mark. The sketches take anything from 5 mnutes to 25 minutes, but generally somewhere in between. It's funny though: do you find that you spend 25 minutes on a so-so sketch, then have just 5 minutes left and so do a throw-away quickie that turns out to be a hundred times more interesting than the other? 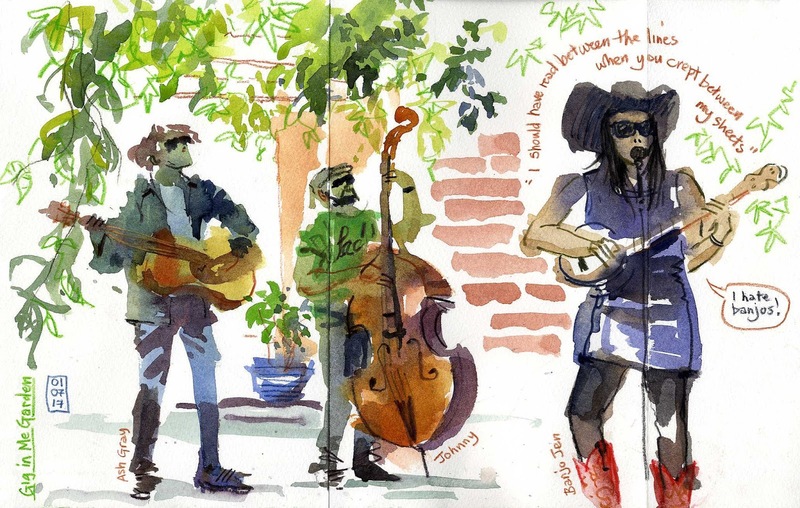 I plan to use more of these tips so I can get out and practice sketching in public more. Thanks! Brillinat story Charles. Well done for showing her. I find people generally LOVE the idea of being drawn - it's something they mostly would never imagine happening! I really enjoyed reading this, Lynne! 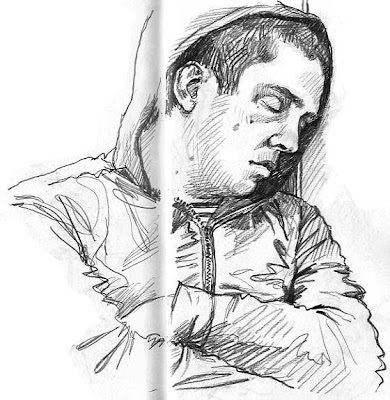 :) I once tried to draw a person while we were on an Airplane, but the guy was just too aware, even though he sat a seat or two ahead of me. I was so nervous! Hahah. And the guy sitting next to me kept staring. It was just weird all around. Haha. Go for it Andrew. You will probably need to adopt new techniques though, as you do have to be speedy. I take anything from 5 minutes to 40 minutes, usually about 15 minutes. people just don't stick around much longer than that, even on a train. Good luck! Great work. I do some drawing myself; I haven't taken up professionally, though. I've always been fascinated by life sketching and have always wanted to develop the hability to do it; however, I've never really gone at it in a very decided way. I tend to be detail oriented and too consciuos about my drawings, and therefore, slow. Also, if you're too conscoius, it's kind of intimidating. I feel that this post might help me summon the confidence to just go ahead and start, and be happy with the results, whatever turns out. After all, there's always another piece of paper, right? 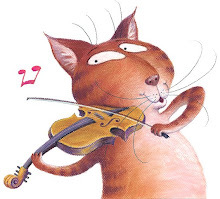 Your illustrations are brilliant, Lynne, just brilliant, keep doing what you're doing. This is really useful. Been sketching for a few months after a break from art since school (40 years ago). Find people really challenging to catch but one thing I've recently been trying is to do the eyes first and work out from them. Really works for me. Anyway, lovely work. Most people react very positive, also in pubs. Thanks so much for including this post in your SketchBook Skool segment. I can definitely use your tips to start several drawings at one time and also to use another color when restating/restarting. These ideas help me feel that my sketching attempts are less like efforts destined for frustration and more like a game or a puzzle with many possible solutions. Cool! That's great Kristy. So glad it works for you! Love to see these examples from your sketchbooks. I do this myself but you have put me into a different gear since i have started looking at your artwork. It will pay off especially for ideas for my cartoons and websites - a great way to record events, experiences, ideas and more. Buy refrigerator online and keep your eatables fresh. I have been a professional artist all my life. 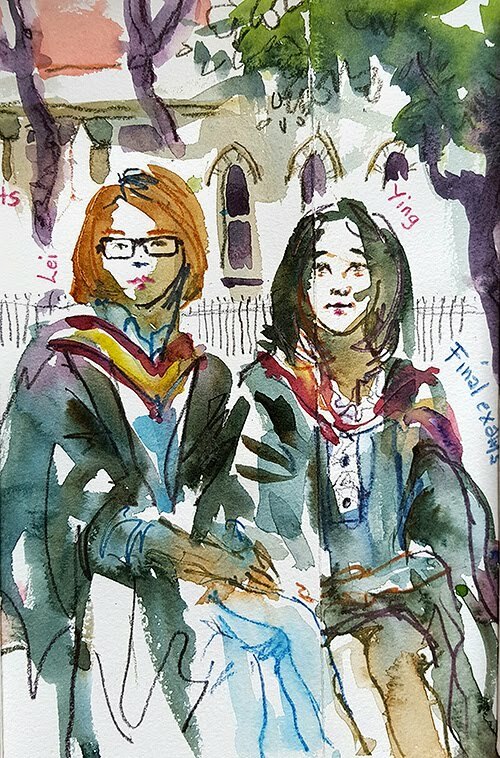 I have illustrated over 30 children's books, created large public murals and now work as a reportage-artist, sketching life as it happens, often alongside academic researchers. In the time between sketching residencies, I create hand-stitched, fine-art textiles, translating my love of mark-making and colour into thread. 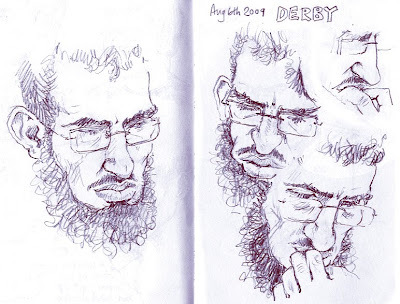 I am an Urban Sketchers correspondent and my book Sketching People was published by Search Press and Barrons in 2016. I give inspirational lectures, and run workshops, both in the UK and abroad, for adults and in schools. I have delivered events in Beijing, Brazil, Spain, the Dominican Republic, Chicago, and Perth, Australia. Email me if you would like to book a talk or workshop. If you are interested in a particular aspect of my work, want to follow an individual project, or find out more Yorkshire's free monthly SketchCrawls, check out the labels below. Want to find something particular? 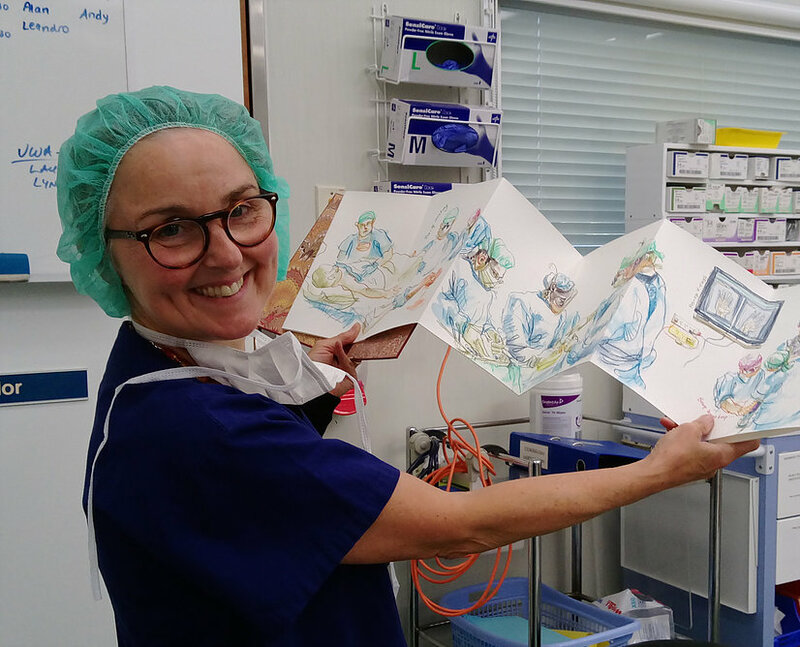 My sketchbook took me to Australia! Want to see my sketching projects? Special offer on my 7-lesson workshop! 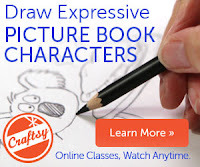 The most important aspects of children’s book illustration is good character design. This class will teach you simple techniques to help you draw pretty much any character you fancy. You will learn how to make them believable individuals who feel ‘alive’ to the reader. All you need are the three ‘P’s: pencil, paper and practice! 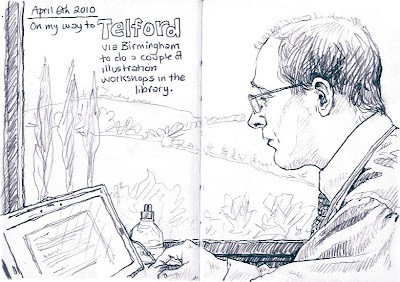 Find out about my sketching residencies! 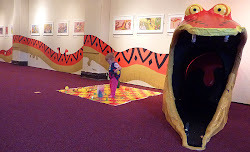 Visit my picture book website! A Tree for the Trees! An Envelope Full of Lovely Things! 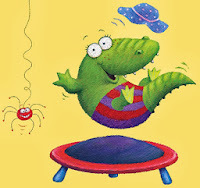 If you enjoy my blog, why not visit my children's book website? How to Make 35 Concertina Sketchbooks!